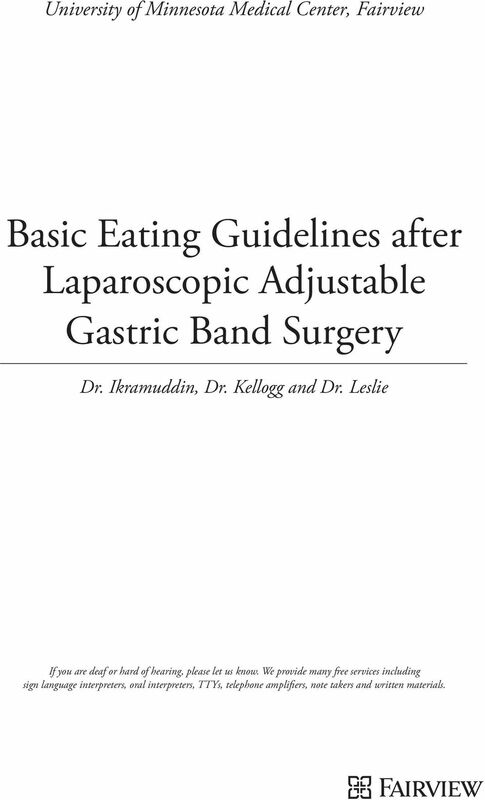 Download "Basic Eating Guidelines after Laparoscopic Adjustable Gastric Band Surgery"
1 University of Minnesota Medical Center, Fairview Basic Eating Guidelines after Laparoscopic Adjustable Gastric Band Surgery Dr. Ikramuddin, Dr. Kellogg and Dr. Leslie If you are deaf or hard of hearing, please let us know. We provide many free services including sign language interpreters, oral interpreters, TTYs, telephone amplifiers, note takers and written materials. 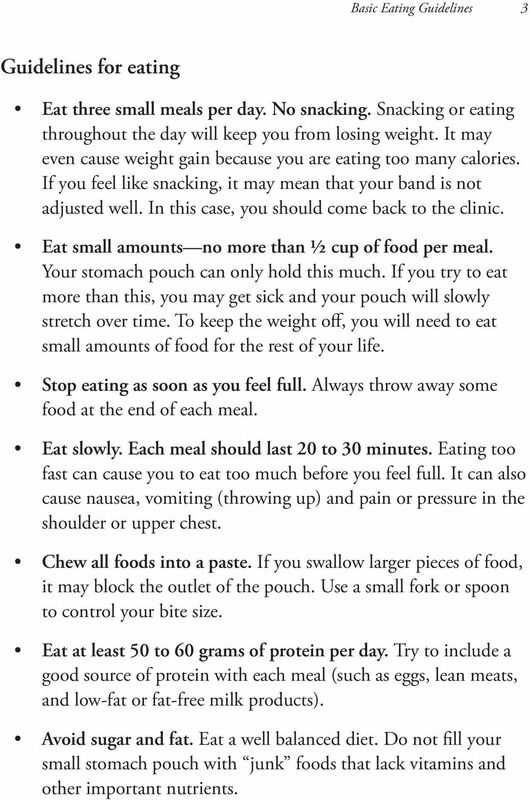 2 2 Basic Eating Guidelines Your gastric band allows you to feel full with only a small amount of food. We will adjust your gastric band as needed to help you lose weight. We will check your band often in the first year or two after surgery. Our goal is to control your hunger as much as possible during this time. You will have about 10 short clinic visits in the first year. After that, you will return every 6 months for the rest of life. At each clinic visit, we will decide together if your band has too little, too much or the right amount of fluid. If we decide to adjust your band, we will add or remove fluid. The exact amount of fluid is different for each person. 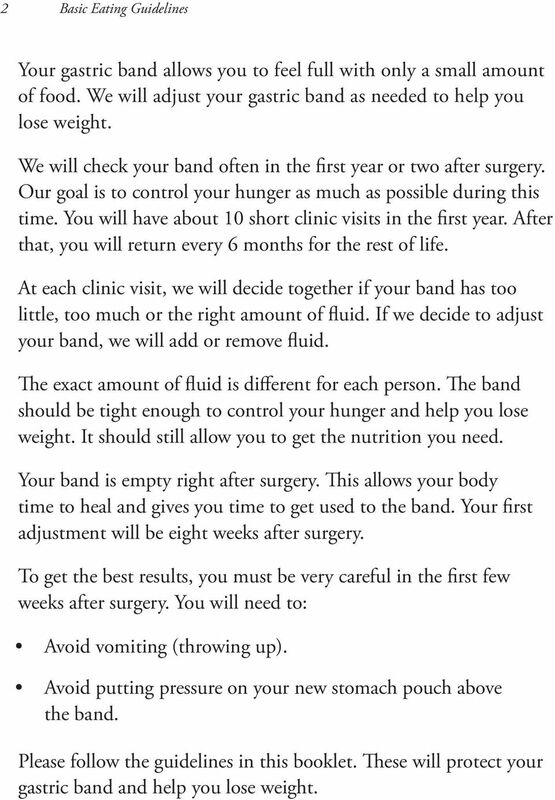 The band should be tight enough to control your hunger and help you lose weight. It should still allow you to get the nutrition you need. Your band is empty right after surgery. This allows your body time to heal and gives you time to get used to the band. Your first adjustment will be eight weeks after surgery. To get the best results, you must be very careful in the first few weeks after surgery. 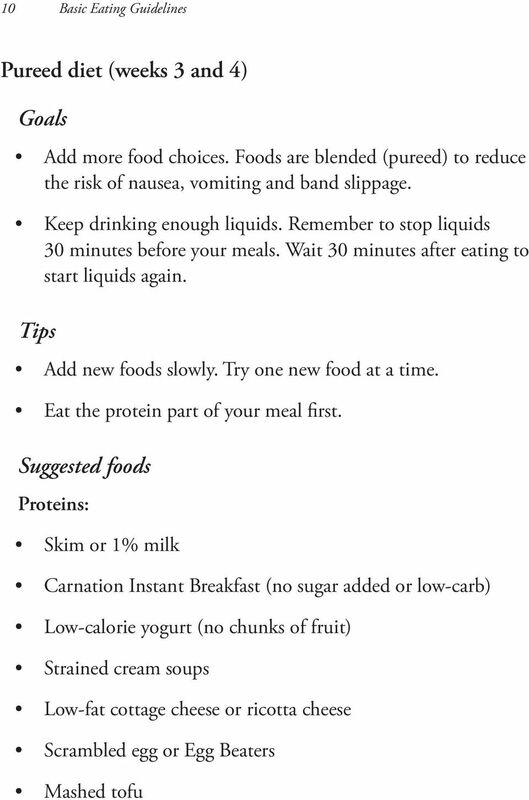 You will need to: Avoid vomiting (throwing up). Avoid putting pressure on your new stomach pouch above the band. 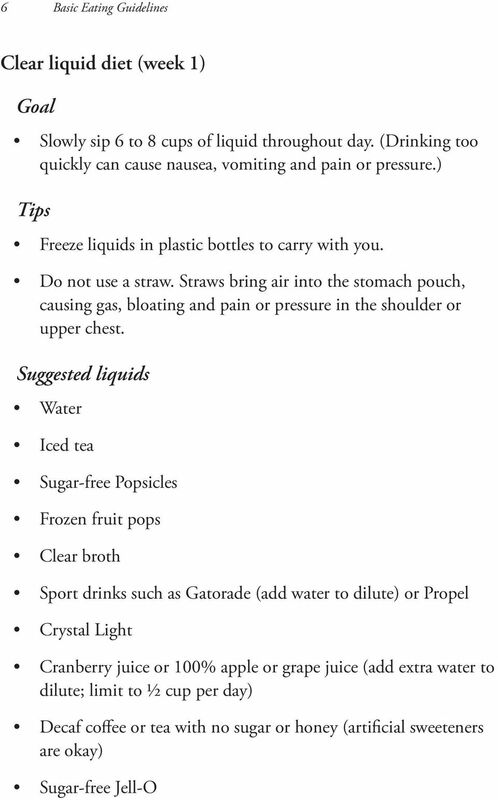 Please follow the guidelines in this booklet. These will protect your gastric band and help you lose weight. 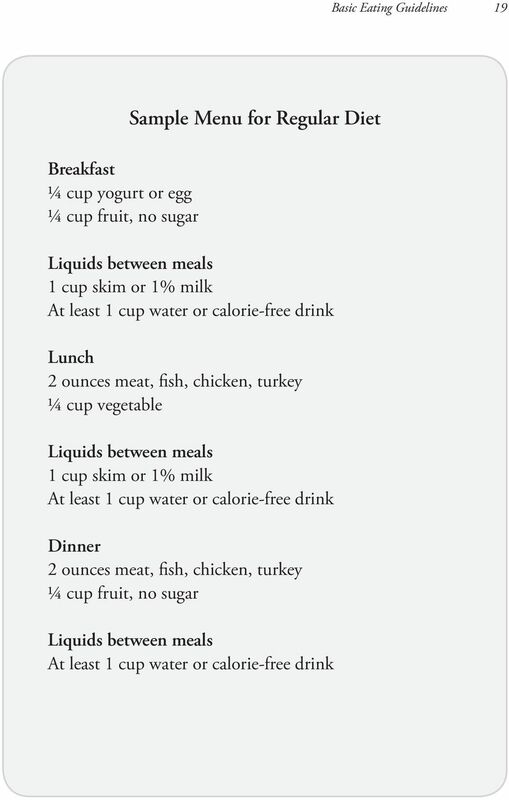 3 Basic Eating Guidelines 3 Guidelines for eating Eat three small meals per day. No snacking. Snacking or eating throughout the day will keep you from losing weight. It may even cause weight gain because you are eating too many calories. If you feel like snacking, it may mean that your band is not adjusted well. In this case, you should come back to the clinic. Eat small amounts no more than 1/2 cup of food per meal. Your stomach pouch can only hold this much. If you try to eat more than this, you may get sick and your pouch will slowly stretch over time. To keep the weight off, you will need to eat small amounts of food for the rest of your life. Stop eating as soon as you feel full. Always throw away some food at the end of each meal. Eat slowly. Each meal should last 20 to 30 minutes. Eating too fast can cause you to eat too much before you feel full. It can also cause nausea, vomiting (throwing up) and pain or pressure in the shoulder or upper chest. Chew all foods into a paste. If you swallow larger pieces of food, it may block the outlet of the pouch. Use a small fork or spoon to control your bite size. 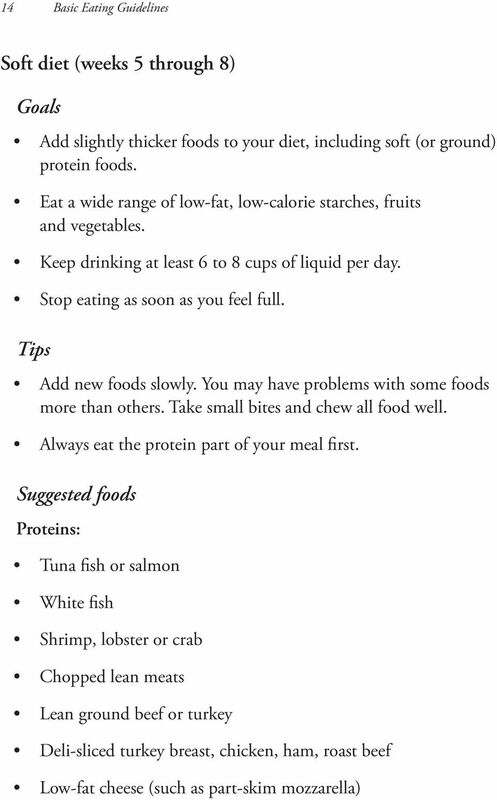 Eat at least 50 to 60 grams of protein per day. Try to include a good source of protein with each meal (such as eggs, lean meats, and low-fat or fat-free milk products). Avoid sugar and fat. Eat a well balanced diet. Do not fill your small stomach pouch with junk foods that lack vitamins and other important nutrients. 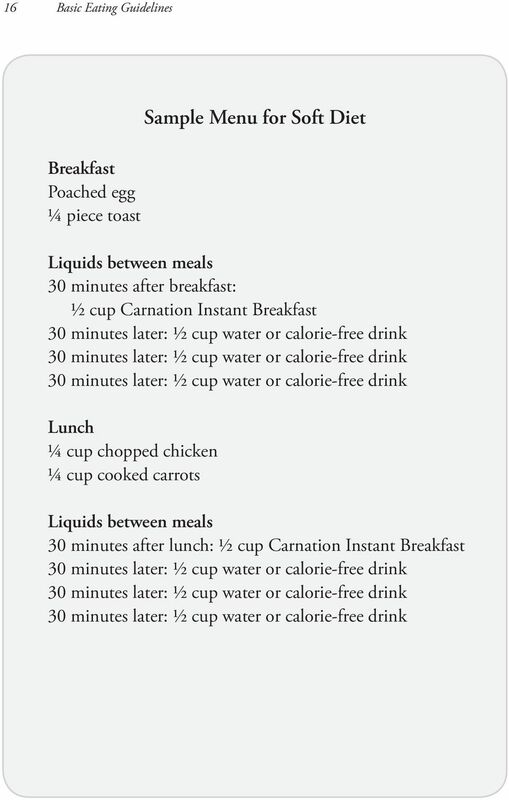 4 4 Basic Eating Guidelines Guidelines for liquids Do not drink liquids with meals. Stop drinking 30 minutes before your meals. Then wait 30 minutes after eating to drink liquids again. This will: Prevent the pouch from overfilling Keep food from flushing out of the pouch too quickly Keep you feeling full longer Sip all liquids slowly. Drinking too quickly may cause nausea or vomiting. 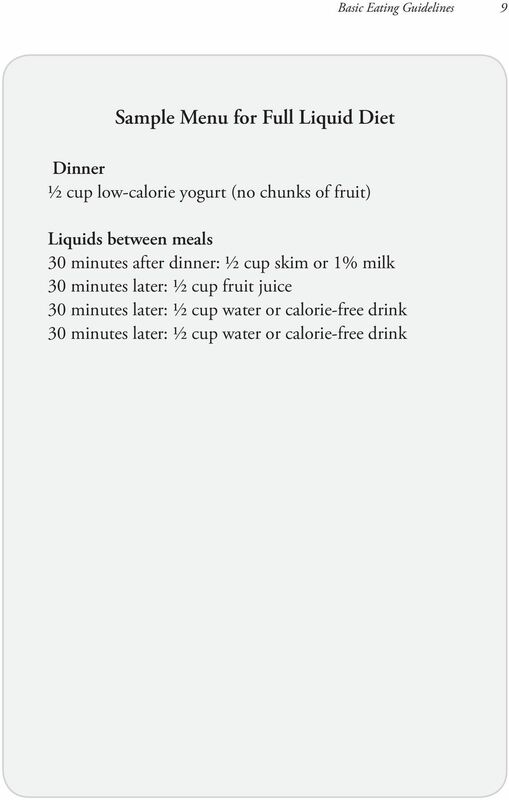 Drink plenty of calorie-free liquids between meals. Plain water is best. Drink at least 6 to 8 cups per day. 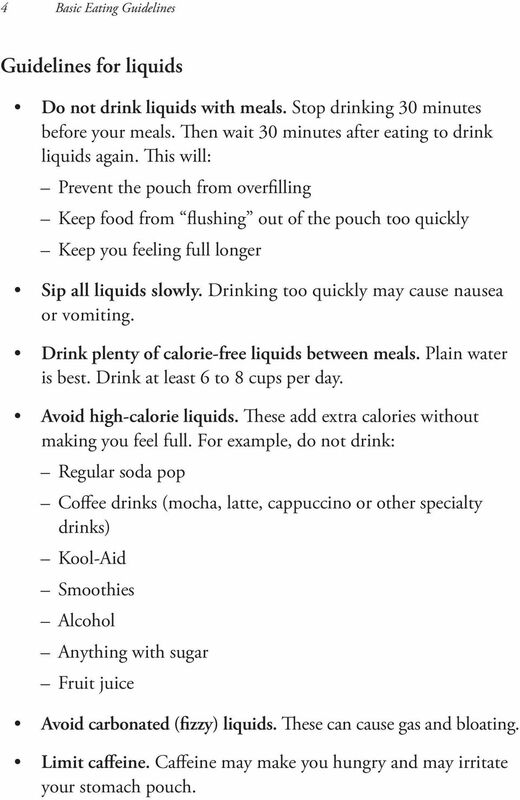 Avoid high-calorie liquids. These add extra calories without making you feel full. For example, do not drink: Regular soda pop Coffee drinks (mocha, latte, cappuccino or other specialty drinks) Kool-Aid Smoothies Alcohol Anything with sugar Fruit juice Avoid carbonated (fizzy) liquids. These can cause gas and bloating. Limit caffeine. Caffeine may make you hungry and may irritate your stomach pouch. 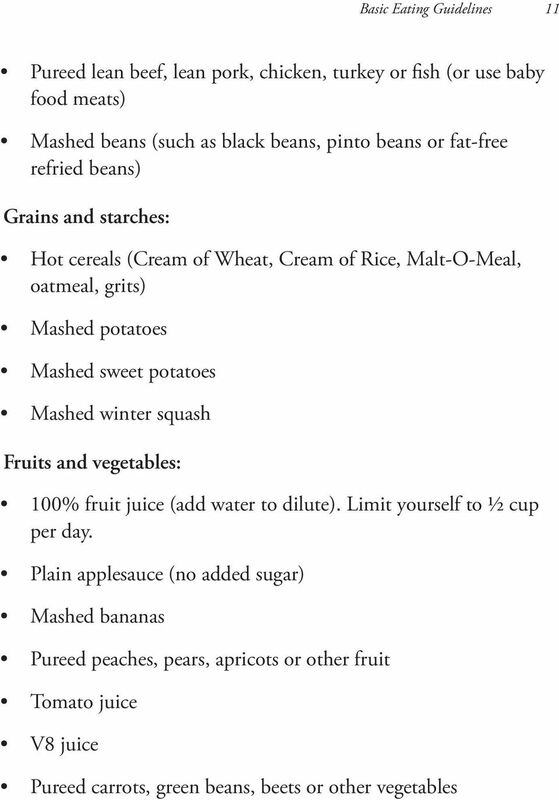 18 18 Basic Eating Guidelines Regular diet (week 9) During this phase, you should be eating a regular diet. This will include foods with more texture and crunch, such as raw fruits and vegetables. 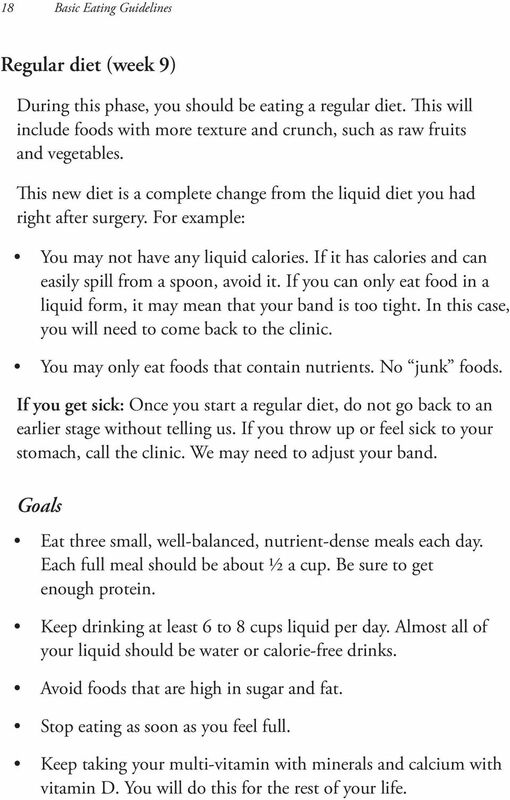 This new diet is a complete change from the liquid diet you had right after surgery. For example: You may not have any liquid calories. If it has calories and can easily spill from a spoon, avoid it. If you can only eat food in a liquid form, it may mean that your band is too tight. In this case, you will need to come back to the clinic. You may only eat foods that contain nutrients. No junk foods. If you get sick: Once you start a regular diet, do not go back to an earlier stage without telling us. If you throw up or feel sick to your stomach, call the clinic. We may need to adjust your band. Goals Eat three small, well-balanced, nutrient-dense meals each day. 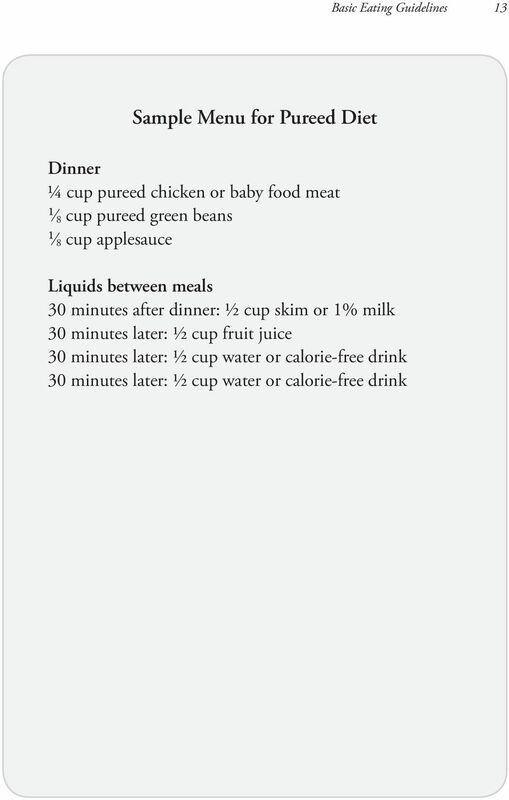 Each full meal should be about ½ a cup. Be sure to get enough protein. Keep drinking at least 6 to 8 cups liquid per day. Almost all of your liquid should be water or calorie-free drinks. Avoid foods that are high in sugar and fat. Stop eating as soon as you feel full. 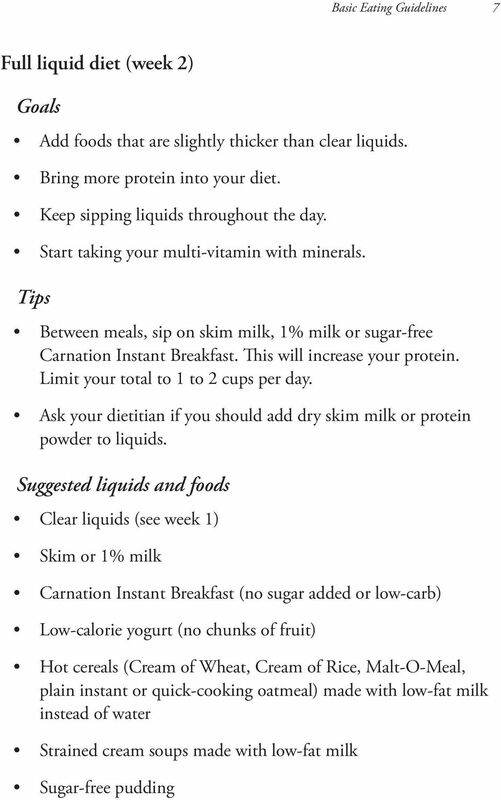 Keep taking your multi-vitamin with minerals and calcium with vitamin D. You will do this for the rest of your life. 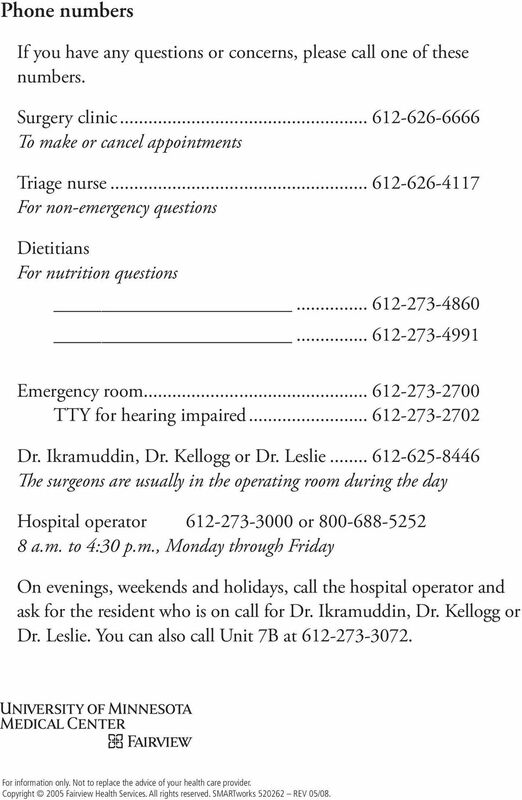 20 Phone numbers If you have any questions or concerns, please call one of these numbers. Surgery clinic To make or cancel appointments Triage nurse For non-emergency questions Dietitians For nutrition questions Emergency room TTY for hearing impaired Dr. Ikramuddin, Dr. Kellogg or Dr. Leslie The surgeons are usually in the operating room during the day Hospital operator or a.m. to 4:30 p.m., Monday through Friday On evenings, weekends and holidays, call the hospital operator and ask for the resident who is on call for Dr. Ikramuddin, Dr. Kellogg or Dr. Leslie. You can also call Unit 7B at For information only. Not to replace the advice of your health care provider. Copyright 2005 Fairview Health Services. All rights reserved. SMARTworks REV 05/08. 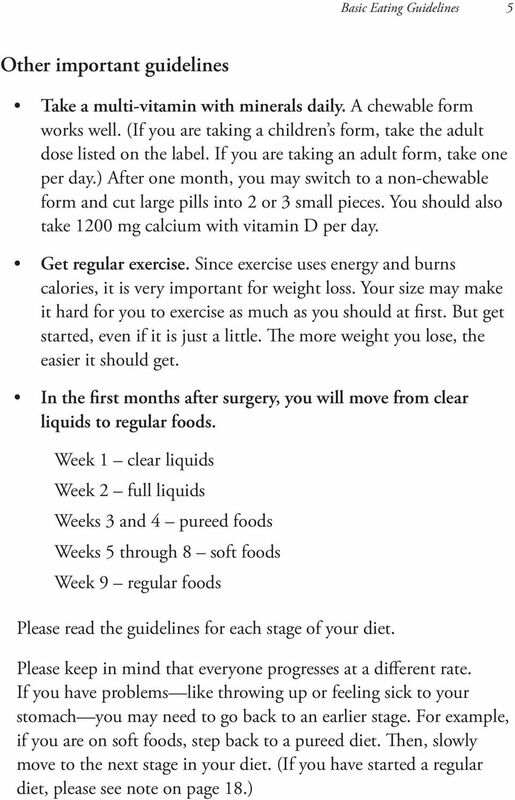 Nutrition Guidelines after Gastric Bypass, Gastric Band & Gastric Sleeve Surgery The information in this packet will help guide you immediately after your surgery and for the months and years to come. 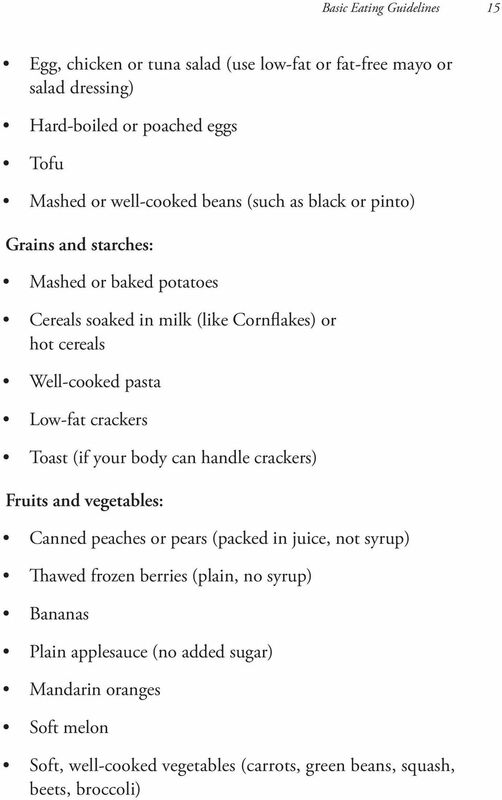 Roux-en-y Bypass & Sleeve Gastrectomy Post-op Diet Information ~Reduced Volume of Stomach Normally the stomach can hold up to 48 ounces of food and fluids. Gastric surgery greatly reduces that amount. DIETS AND DIET MODIFICATION LIST. Pudding: Liquids that have been thickened to a pudding consistency. They remain on the spoon in a soft mass. Definition. Adult Diet Name NPO. 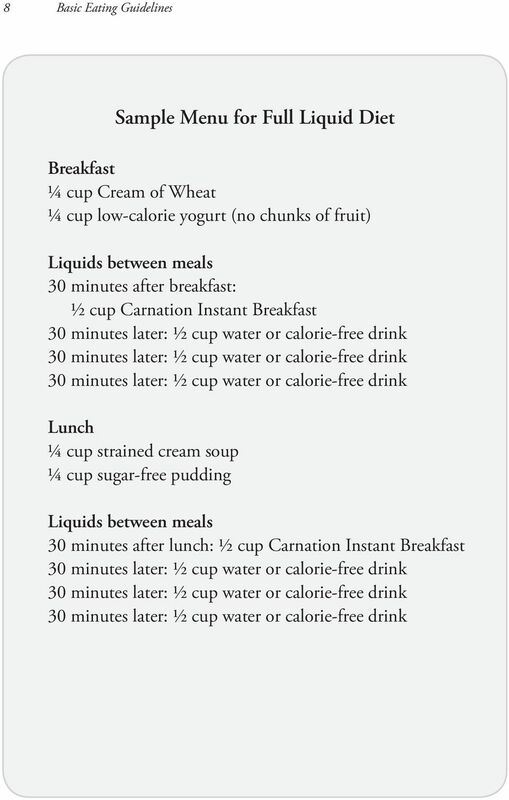 Clear Liquid Diet. 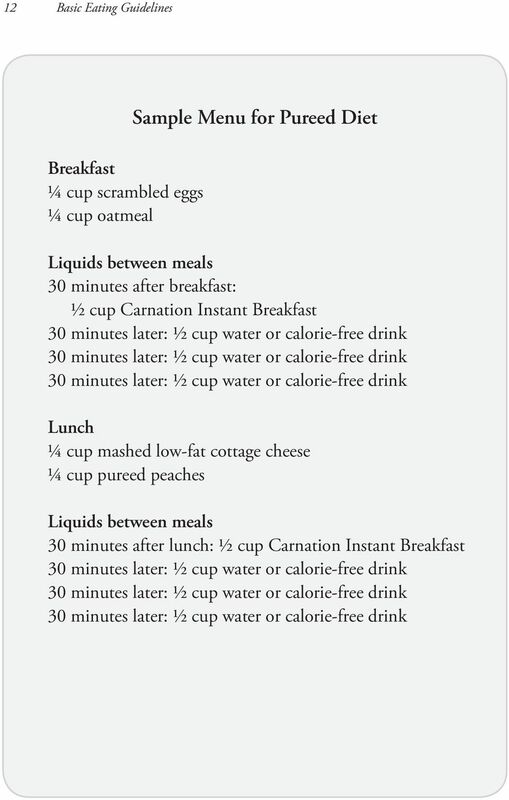 Full Liquid Diet (Blenderized Liquid Diet) Regular Diet. Vegetarian Diet. You can eat healthy on any budget Is eating healthy food going to cost me more money? Eating healthy meals and snacks does not have to cost you more money. In fact, eating healthy can even save you money. Blenderized & Pureed Recipes While you are having difficulty chewing or swallowing, use these recipes for preparing pureed meals. Use the recipes as a base for developing your own recipes. Be creative!